You might think someone whose book has “meatballs” in the title would have a good recipe not only for beef meatballs but also for chicken. I didn’t though—until now. I think it took me so long because I had some high demands. Flavorful and fresh, of course. Not heavy or gooey like Swedish meatballs, but still with a little creaminess that didn’t come from dairy. 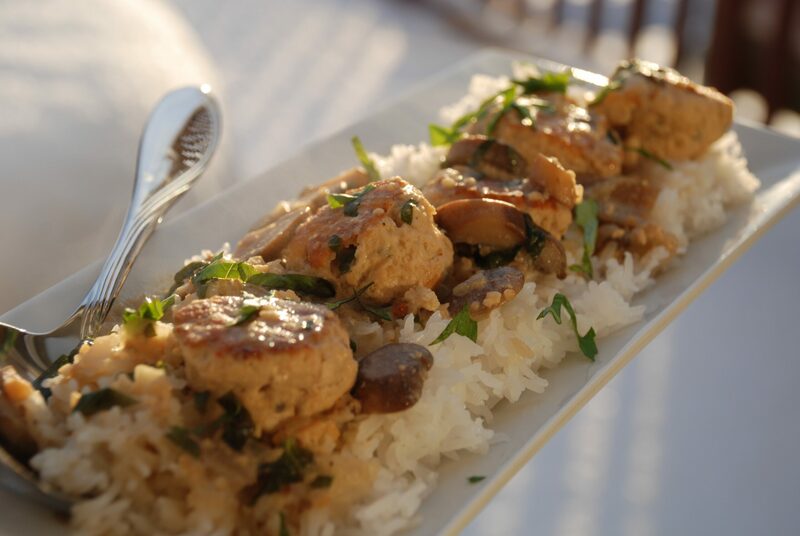 With some Jewish and Italian characteristics, such as using fresh herbs and paying homage to Jewish chicken “fricassee” dishes with meatballs that come from both Jewish-Italian and Jewish-American cooking. And recently, to make it even more challenging, I decided I wanted a meatball recipe for just about everyone and for all times. That meant meatballs my friends and family on gluten-free, nondairy, and non-processed foods diets could make and eat. We could enjoy them at Hanukkah as well as Passover or just for a casual dinner. They could work as a party buffet appetizer or an entrée spooned over noodles, rice, or nondairy mashed potatoes. Given that they are indeed meatballs, they just don’t work for my vegetarian or vegan friends (or those who can’t eat eggs)—sorry, there will be plenty of recipes for you, too, I promise. For now, I’m pleased to present my chicken meatballs with a richly textured mushroom and basil sauce. For binding the meatballs, I used cooked baking potatoes instead of bread, which eliminates both gluten and a processed ingredient. Pushing the potatoes through a ricer keeps them fluffy and easier to incorporate. And you know what? Potato creates a nice tender meatball. For flavor, I settled on fresh thyme (the typical meatballs’ herb oregano was too strong here). And yes, it can try your patience removing thyme leaves from the stems when you’re in a hurry, but the minty-lemony accent fresh thyme gives is worth it. A little splash of white wine brightens the chicken flavor as well. Two unusual ingredients achieve a little bit of creaminess and thickness in the sauce. First, a little cream from a can of whole unsweetened coconut milk gives a creamy effect with just a subtle coconut flavor. This is optional, but very nice. Second, ground cashews thicken and add a little more creaminess plus some nutty flavor to the sauce (but if you have nut allergies, the sauce can be thickened with a starch mixture and is good that way, too). Lots of thinly sliced mushrooms, more white wine, and a generous handful of basil round out the sauce. Given that we kept eating these meatballs before I remembered to measure the recipe’s yield (so I had to keep making them over and over again), I’d say these taste pretty great hot out of the pot. However, they taste even better reheated the next day—a flexibility that I love in recipes and that makes this one a good option for entertaining as well as a quick weeknight meal. You can think of them as comfort food or special food—or both. 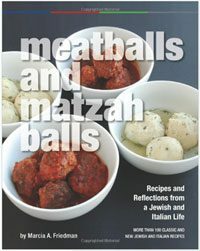 In Italy, Jews often served their polpette (meatballs) for Sabbath dinners as well as festivals. In that spirit, this recipe comes just in time for dinner this weekend as well as for the festival of Passover, which begins at sundown on April 14 this year. And we’ll be enjoying my Jewish-Italian–inspired meatballs “for all times” on many occasions after that. Sometimes a lighter, fresher-tasting meatball is called for, and these thyme-scented chicken meatballs in a mildly nutty mushroom and basil sauce fit the bill—while still keeping meatballs’ comfort-food bona fides, of course. They are dairy-free and gluten-free (and can be made nut-free). Plus, they are kosher for Passover and a nod to Jewish-Italian traditions of serving meatballs for Jewish festivals. Potatoes stand in for breadcrumbs, which I think adds pleasant taste and texture; the wine brightens the flavor of both the chicken and sauce, but you can substitute broth for it if you like. Serve over nondairy mashed potatoes at Passover. This recipe yields a generous amount, can be made in advance, and freezes well. A small 187 milliliter bottle of white wine will provide enough for both the meatballs and sauce. Loosely cover the potatoes on a microwave-safe dish and microwave on high until cooked all the way through, about 10 minutes. When cool enough to handle, peel and discard the skins, and push potatoes through a potato ricer or grate using the small holes on a box grater. Spread out on a plate to cool slightly while you prep the other ingredients for the meatballs and sauce. In a large bowl, gently combine the chicken, egg, onion, thyme, salt, pepper, wine, and 1 cup of the potatoes (save any leftover potatoes for another use). Using lightly oiled hands, form chicken mixture into 1- to 1½ -inch balls. Heat a thin layer of olive oil in a nonstick Dutch oven or other deep-sided pan over medium-high heat. Add meatballs to the pan, making sure they don’t touch each other. Once the bottoms are brown, nudge them gently with a spoon to brown them on at least two sides, 6 to 8 minutes (they do not need to be cooked through). Transfer to a paper-towel lined plate. Repeat with remaining balls. After all the meatballs are fried, drizzle a little more olive oil into the hot empty pan and add the shallots, mushrooms, and 1 tablespoon of wine. Season lightly with salt and pepper. Sauté until vegetables are softened and fragrant, 3 to 5 minutes. Add the chicken broth, the ½ cup wine, and, if using, the coconut cream. Bring to a boil. Gently stir in the meatballs. Cook loosely covered and at a low boil for about 30 minutes, stirring occasionally. Increase the heat and return to a boil. Stir in the cashew meal or ground cashews a spoonful at a time, fully incorporating each addition before adding the next. The sauce will be like a thin gravy. Stir in the basil, and cook 2 to 3 minutes more. Serve warm over rice, pasta, or, at Passover, nondairy mashed potatoes. Garnish with fresh basil. Can also be set out on a buffet in a warming dish with toothpicks. If making in advance, cover and refrigerate and then reheat gently over low heat at serving time. The recipe also freezes well. • For Coconut Cream: Optional—the recipe tastes fine without it but coconut cream adds a little creaminess and subtle flavor to the sauce. To get the coconut cream, start with 1 can whole unsweetened coconut milk (I had very good results from Native Forest unsweetened organic coconut milk, which is certified kosher). Refrigerate the can for 24 hours or freeze it for 1 hour (don’t freeze much longer or it could freeze solid, which is a real pain, trust me). The cream should separate from the water and rise to the top; just open the can and spoon out the cream for the recipe. Leftover cream freezes well. At this time, there is no canned coconut milk certified kosher for Passover, so for the holiday, omit the coconut cream. • Nut-Free Option: Omit the cashews. To thicken the sauce, add 1/3 cup potato starch to a small bowl, and stir in 1/3 cup of water to make a thick liquid. When the meatballs and sauce come to a full boil, stir in the starch liquid a little at a time, using only what you need to slightly thicken.